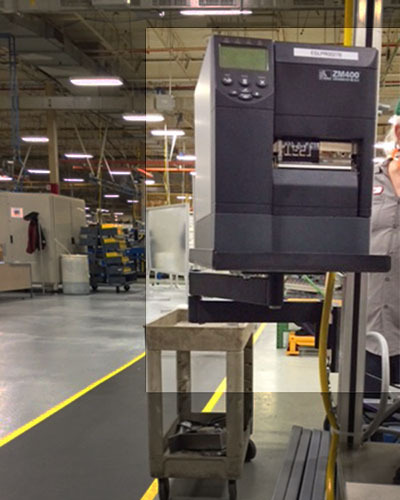 Dectron Articulating Kaizen Arm mounted to an extruded aluminum upright and supporting an industrial printer. and positioning of industrial printers. These devices are often bulky and heavy, take up quite a bit of space, and are generally not easy to access. Using Kaizen Arms to support these devices can often alleviate and drastically improve the above downsides substantially. Using an arm to support the printer can free up valuable desk space or even get printers into tight areas that might not have enough floor space for a desk or bench to begin with. Because Kaizen Arms can be mounted to a wide variety of surfaces, there’s almost always some sort of an available surface to mount an arm to. In addition, articulating Kaizen Arms can enhance ergonomics and point of use access by allowing the printer to be positioned at arms reach when in use, or conveniently folded out of the way when not needed. Optional cable covers route all cabling safely along the exterior of the arm while a heavy duty 100 pound capacity for folding 2 axis systems ensure plenty of strength to handle just about any industrial printer you need to accommodate.